Today's Tech Talk: How to delete Google and Yahoo Account??? Google has given us so many good webservices which include Gmail a web mail, Orkut a social networking, Web Search history, Book Search, Adsense, Checkout and many more. I suppose their will hardly any user who will not be happy with any of this web service. 2. Click on Edit link beside My products heading. iii. Click “Yes” to confirm and Delete Your Google Web Service Account. ii. A page with title “Please Read Carefully” listing Google Services will appear. 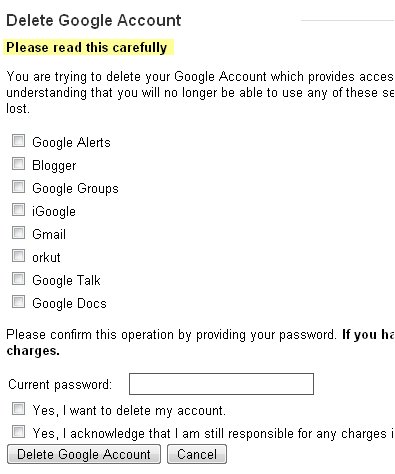 iii You need to confirm and acknowledge this action and once you click Delete Google Account your Google Account will get Terminated permanently. How do I close Yahoo! account? If you want to close your Yahoo! 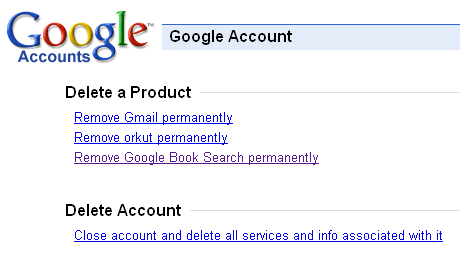 account, you can follow the steps on the Account Termination page. You will be asked to sign in or to verify the password for the account you want to delete. Note: Before deleting your account, please read the instructions on the Account Termination page carefully, as important information about your account is included. You can then confirm the deletion of your account. * Please complete the deletion process only if you are certain you want to remove your entire Yahoo! account and any features you have personalized within the account. After you delete your Yahoo! account, you can’t reactivate it, although you can always sign up for a new account. * Deleting your Yahoo! account does not alter or delete your Yahoo! People Search listing. You must edit or delete this separately. * If you are subscribed to any premium services, we recommend that you cancel them before you delete your account. There is no guarantee that deleting your Yahoo! account will immediately cancel the billing for any premium services you are subscribed to. To cancel your current subscriptions, visit Yahoo! Billing Information for your account, click My Services, and then click the Cancel link for each subscription. Good article. You may interested to check out the URL below to learn on how to close your Yahoo! account. Step by step instruction is provided.